* B-2 visa type is for or general pleasure, visit to friends and relatives, medical treatment, and amateur/unpaid participants in cultural or sports events. * A US visitor visa is customarily granted a validity period of a minimum of three (3) months or a maximum period of ten (10) years. * Every visit is however, limited to a maximum stay of six (6) months. * The issuance of a visa is not a sure-fire guarantee that the applicant will be allowed entry in the US since said holders are still subject to the scrutiny of the Department of Homeland Security (DHS) officials who are likewise empowered to deny entry even to valid tourist visa holders. * It may be issued in either a “single” or “multiple” entry format. * The application procedure for first time non-immigrant visa applicants and applicants who were previously issued a nonimmigrant visa is the same. * If you are not a first time applicant, you may be eligible for an appointment through the Visa Reissuance Program (VRP). Please read this information to know if you are qualified. * A fee applies to only one visa classification/application. If an applicant wishes to apply for more than one visa simultaneously, corresponding payment per visa class must be made. * Visa application fees are non-refundable and non-transferable. No exceptions will be made to this rule. It is valid for one year after the date of actual payment; the interview must fall within the one-year validity. * All basic documentary requirements must be ready BEFORE an appointment can be made. Additional documents may be required, so please read the information below carefully. * The Nonimmigrant Visa Unit does not accept documents BEFORE the interview except for Treaty Trader (E1) and Treaty Investor (E2) visa applications. Any documents received will not be returned and will be destroyed (except the passport). 2. PASSPORT – Signed passports must be valid for at least six months from the date of intended departure from the United States. 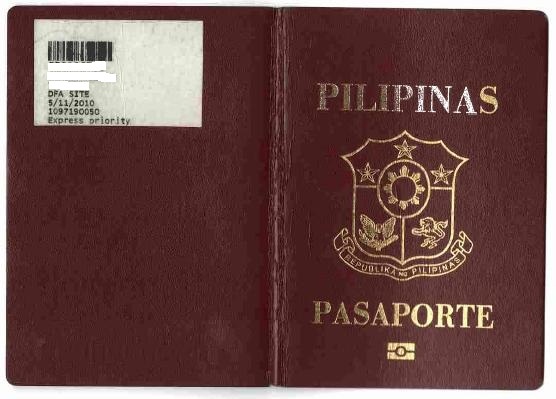 The passport must be in good condition, i.e., photo lamination is undamaged, and all passport pages are intact. 3. PHOTO - 1 pc. 2" x 2" standard photo. The photo must be in color, taken within the last 6 months to reflect your current appearance, taken in front of a plain white or off-white background, taken in clothing that you normally wear on a daily basis. 4. PROOF OF RELATIONSHIP (if applying with/for dependent/s) - Original marriage certificate printed on Philippine National Statistics Office security paper, if applicable (if applying with a spouse and/or child) and original birth certificate printed on Philippine National Statistics Office security paper (for dependent/s). All documents must be originals. Photocopies will not be accepted, unless specified. The applicant must submit these documents to the interviewing consular officer during the interview. The Nonimmigrant Visa Unit does not accept documents before the interview. Any documents received will not be returned and will be destroyed. Please note, however, that presentation of the documents will not guarantee visa issuance. * Applicants are requested to arrive at the Embassy gate 15 minutes before the time listed on the appointment letter. * Applicants must bring all the basic application requirements including the interview appointment letter, DS-160 confirmation page, valid passport, one 2” x 2” photo, and all prior passports and U.S. visas, if available. It is helpful to bring a government-recognized photo ID (in addition to the passport) to present upon entry. * Important note: American citizens and US Legal Permanent Residents are not allowed to accompany non-immigrant visa applicants to the interviewing area. * The secret to an almost guaranteed approval of a US tourist visa is to BE BRIEF! * As long as the applicant proves that his intended stay in the US is temporary, then the chances of approval of the visa application are high. * In a typical 8-hour day, a consular officer may need to interview 150 applicants or more, which allows about 3 minutes per applicant. * Always keep in mind that the interviewing officer is more concerned with whether the applicant will return to the Philippines than why the applicant wishes to visit the United States. * A consular officer will inform the applicant at the conclusion of the interview whether he/she qualifies for a U.S. visa. * If the visa application is approved, the average visa processing time usually takes approximately one (1) week, depending on the volume of the visa issuance. Thus, the applicant will more likely receive the passport with the US Visa attached therein one (1) week after the approval. The passport with U.S. visa will be delivered by the courier service at the address provided when the made the appointment. If the applicant is not present at the time of the delivery of the passport, the applicant must leave an authorization letter to a representative and a government-recognized photo ID for both representative and applicant. Both the applicant and the representative must sign the authorization letter. * If the visa is denied, reason will not be disclosed. * please call (02) 301-2104; available from 8:00 a.m. to 10:00 a.m. and 1:00 p.m. to 3:00 p.m., Monday through Friday, except US and Philippine holidays. This number is for general inquiries only. NO TELEPHONE inquiries on an specific applicant’s case will be entertained. All inquiries must be in writing. 1. Go to www.ustraveldocs.com/kw (create a profile to login). 3. Please print and take your deposit slip to any Burgan Bank location to pay your visa application fee. 4. Schedule an appointment for your visa interview (preferably minimum of 1 month before flight date) online at https://cgifederal.secure.force.com/?language=English&country=Kuwait or by phone through the Call Center (at +965-2220-4144). 5. If you need to change or cancel your appointment, please do so 24 hours beforehand. * Visa applicants ages 14 through 79 must appear in person before a Consular Officer for an interview and to scan their fingerprints for biometric identification. * Applicants should request an interview at the Embassy or Consulate with jurisdiction over their area of permanent residence. For example, those applying in Kuwait City should be Kuwaiti citizens or hold legal Kuwaiti residency and be able to demonstrate strong economic, familial and/or social ties to the country. * After requesting a visa appointment, you should receive an appointment date and time within one (1) business day by return email. * Arrive thirty (30) minutes prior to your interview time. Proceed to window #2 at the Embassy’s main gate and present a copy of your appointment notice. * The wait for your personal interview may last several hours, especially during the summer rush, so you are encouraged to bring reading material. Bring a second form of identification (for example, Kuwaiti civil id) to leave with the guard before entering the Embassy in addition to your passport. 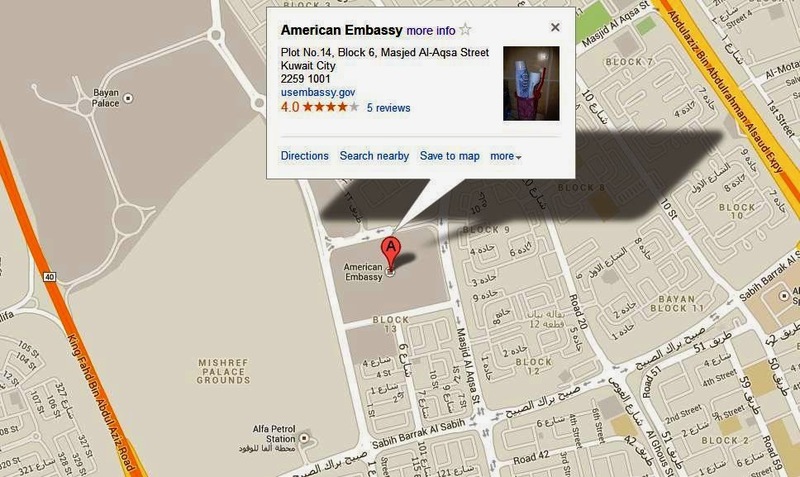 * You will pass through a security screening prior to entering the Embassy. Leave mobile phones, pagers, cameras and other electronic devices at home or in your vehicle. Visa applicants are not permitted to bring these items onto the Embassy compound. 1. Take a number: Once you enter the Consular Section, take a number from the machine and have a seat in the waiting room. Once your number is called, proceed to the appropriate window to begin processing. 2. Complete all forms: Ensure that all required forms have been completed in their entirety before approaching the window. Have your Burgan Bank receipt and photos in hand. 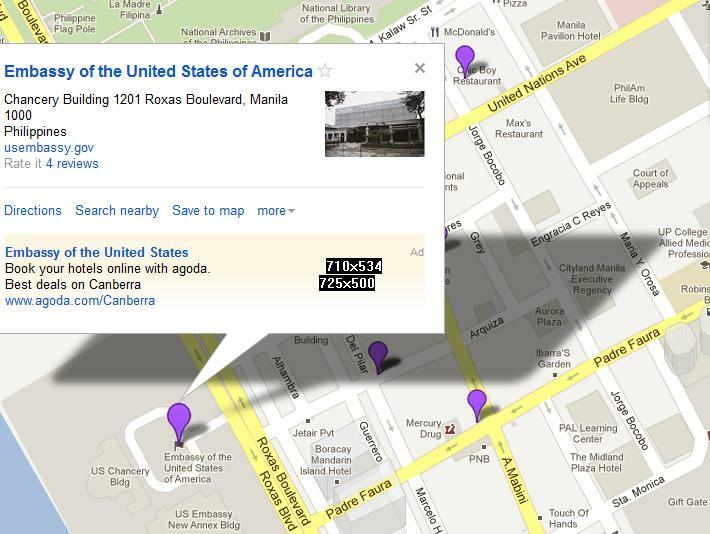 Note: You must include the full address of the location (home, hotel, etc.) where you will be staying initially in the United States. Incomplete or unsigned forms will not be accepted. 3. Customer service statement: Read about what you can expect from our consular staff during your visit and our expectations of you, the applicant. 4. Fingerprints: Prior to your interview with a Consular Officer, you will be required to scan your fingerprints for biometric identification. - Pay visa issuance fee: Citizens of certain countries (NOT Kuwait) must pay an additional visa issuance fee once their applications are approved. The Consular Officer normally advises the applicant at the conclusion of the interview if an issuance fee is required. Refer to the visa reciprocity table to determine the exact cost by nationality. Fees may be paid at the Embassy in cash (KD or USD) or by credit card (American Express, Diners Club, MasterCard and Visa). - Occasionally, the Consular Officer requires additional information from you in order to determine your visa eligibility. The Officer will inform you, in writing, what you need to provide to conclude your case. You may return the information to Aramex for further processing. Based on the additional information, the Consular Officer will decide whether your application is approved, held pending administrative processing or refused. - In most cases, applications are refused because the applicants were unable to demonstrate a valid purpose of travel or to provide evidence of strong economic, familial and/or social ties to a residence outside of the United States (in this case, Kuwait) to which they are compelled to return. The Consular Officer will inform you, in writing, of the reason for your refusal. You are welcome to reapply for a visa at any time. We recommend, however, that you wait until your personal conditions (economic, familial, etc.) have changed, which would strengthen the merits of your application. 1. Original passport and civil ID (and one copy of the passport), for each applicant. - Current proof of income, tax payments, property or business ownership, or assets. - Your travel itinerary and/or other explanation about your planned trip. - A letter from your employer detailing your position, salary, how long you have been employed, any authorized vacation, and the business purpose, if any, of your U.S. trip. 4. Mobile phones and Flash Drives are not allowed. (Please keep them in your car). It is advisable not to purchase non-refundable travel tickets or to confirm any travel plans until you receive a valid visa. Bayan (block 6) near the intersection of Routes 206 (Khaled bin Abdul Aziz St.) and 302 (Masjed Al-Aqsa St.). Once you are on the Payment screen, click on Payment Options. Review the Cash at Bank section for further details. You have to print your deposit slip and take it to the bank. The teller will take this deposit slip in exchanged to deposit receipt. A Burgan Bank receipt, valid one (1) year from the date of issuance, for the $160 (48KWD) fee is required. Have your passport with you when paying the fee. This fee is nonrefundable even if visa is not granted. (I paid in Farwaniya branch. I received an email confirmation that my payment has been successfully received and I can now continue my application and chose my preferred appointment schedule).